It’s time to dive a little bit deeper into the Marvel Cinematic Universe, and this time, we’re going where not many have gone before. We’ve heard about Wakanda in passing, but now it’s actually time to visit it. And oh boy, judging from the first trailer for Black Panther, this is certainly going to be a trip of a lifetime. We first heard mention of Wakanda back in Avengers: Age of Ultron when we met Klaus, that dude hell bent on keeping all the vibranium for himself (vibranium = what Captain America’s shield is made out of). We then actually met a few citizens from Wakanda during Captain America: Civil War — and sadly, the King of Wakanda was killed shortly thereafter, leaving his son, T’Challa, to rule. Also, become Black Panther. However, as the trailer makes it clear, ruling as king and fighting as Black Panther isn’t going to be easy for T’Challa, once again played by Chadwick Boseman. For starters, Klause is back and pretty PO’ed (he lost an arm, remember). Also back, Martin Freeman’s CIA operative Everett K. Ross, a Wakanda ally. 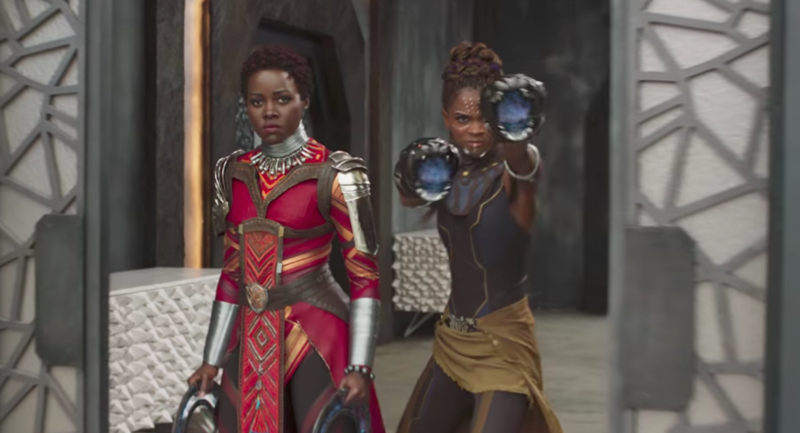 But enough about familiar faces, it’s time to get to the new ones, like Michael B. Jordan, Lupita Nyong’o, Danai Gurira, Daniel Kaluuya, and Angela Bassett, who all pop up in the trailer looking hella amazing and ready to fight. There are still two other Marvel movies due out this year — Spider-Man: Homecoming and Thor: Ragnarok — but…Black Panther might be the best Marvel movie of the year. Just saying. And we’ve barely even got two minutes of it! But more importantly, will T’Challa be able to off inside and outside forces threatening to ruin Wakanda, while also trying to rule as king? We’ll find out on February 16th, 2018.